He hadn’t heard the car, which had arrived approximately ten minutes earlier. Nor had he heard the car doors slam or the voices being swallowed into the stucco as Keith and Phil had walked from the car into the house. He hadn’t felt the atmosphere of the small Los Angeles house change with an air of excitement as Keith had come inside, had been introduced to Phil’s girlfriend, and had taken off his jacket and slung it over a chair in the kitchen, but kept his mirrored sunglasses on. The gravelly voice, like whiskey blended with Marlboros, cut through the stagnancy and the silence of the patio, arousing Gram at last from the red glow which had gripped him. He breathed in sharply and opened his eyes. But instead of seeing Keith, he saw his own image. Not once but twice. Grotesquely disfigured by the convexity of the mirrored sunglasses in front of him, the twin demonic doppelgangers stared back at him. Keith paused before answering, feeling his own pulse quicken upon seeing and holding his friend. The once tan and vibrant skin now seemed a pale gray; the lively charming eyes, now bloodshot and puffy; the full lips and alluring smile, now sallow and scowling. He felt as if he were sitting with a stranger. He looked away–down, down at their hands, his own still encircling Gram’s wrist, and felt temporarily reassured. Gram’s hands were the same, the fingers still long and powerful, proudly containing the talent that coursed through them. “Yeah . . . it was just a house,” Gram shrugged and smiled, but then closed his eyes. He kept them closed. He vaguely wondered what he’d done with his own pack of cigarettes, unaware that it lay on the cement underneath his chair, flat and crumpled, its contents used up. Keith watched the sun ripple lightly on the stagnant pool. Vraaaah. Kathy stepped through the sliding glass door and appeared on the patio, a glass of lemonade in her hand, the sun creating a halo effect around her hair. She set the glass on the cement next to the lawn chair, where Gram’s sunglasses had just been, and opened her other hand to reveal two small white pills. Gram’s eyebrows rose. “Nothing helps my head,” he complained, but sighed with resignation and pried his wrist free of Keith’s grip to take them. Keith noticed Gram’s hands were shaking. “Well, drinking does usually lead to a hangover,” she smiled and kissed his forehead, soothing and warm, kissing him in just the right place. “Why are you guys so nice to me?” He returned the smile. She lingered for a moment, but didn’t answer, then retraced her steps back into the house. “God dammit!” And in perfect unison with ‘dammit’ he flung the empty bottle against the stucco, the shattering sound reminding him of the window he’d had to shatter during the fire, and how he had lifted Gretchen up and pushed her through, to the safety of the lawn below, and how her blond hair had trailed behind her, looking odd and somehow foreign in its unexpected course of travel, and he remembered her voice as she screamed at him to come on!, but he had to find his lyrics sheets, and photos of his parents, and his books, and his guitars . . . and photos of his parents . . . and he could hearing the crackling, and feel the heat, and saw everything burning, saw everything being destroyed, and the smoke, the smoke, the smoke. Closing his eyes, he swore he could still smell it. He didn’t realize it was actually just Keith’s cigarette. “Hey! Cool it out there!” Phil’s voice yelled from the other side of the stucco. Keith stared at the fragments, glittering on the cement like a splintered sun, a thousand bright stains now broken and scattered. “Easy, buddy . . . you never used to be this pissed off,” he joked, fully expecting Gram to return the laugh. But instead, Gram slouched back into the lawn chair, his pale wrist once again dangling over the side, as if asking Keith to please resume checking for a pulse. Keith did so. A silence followed, broken only by their heart beats, the light scratching of the palm frawns against the stucco, and the sound of dishes moving about in the kitchen. Keith took a sip from Gram’s lemonade, which was sitting neglected, and tried to avoid looking at the shattered glass on the cement. For some reason it reminded Keith of vomit which no one had gotten around to cleaning up. To distract himself, he stretched his hand out toward Gram’s arm. He began stroking it gently, running his hand from Gram’s shoulder to his hand. Gram’s eyes were closed, and he was still hidden underneath the scarf. His arm jerked slightly, just once, but then it relaxed, and his breathing became deep and regular. “He asleep?” Phil asked as he stepped outside, lemonade in hand. “He’s actually better now than he was a few weeks ago. I just keep dumpin’ his booze as fast as he can bring it into the house.” Phil watched Gram sleep while they talked. Although the sun hadn’t moved from its position high in the afternoon sky, Keith suddenly felt the atmosphere darken. Perhaps the sun was starting to set prematurely. Or perhaps it was a rare storm cloud on the horizon. He tried to swallow but felt an odd lump, a hardness in his throat which wouldn’t go away. He felt Gram wince slightly and he realized he was squeezing his arm with a pressure he hadn’t intended. Keith took a deep breath. He needed to leave. He needed to leave now. He slid his hand upward and gave Gram’s forehead one last gentle caress, and his hand one final squeeze, and then let it slide through his fingers. Keith stood up. Without having to ask, Phil knew he needed a ride back to the hotel, and got up to accommodate him. Behind his eyelids, Gram heard their voices grow dimmer as they closed the sliding glass door behind them, and walked through the house. He heard the front door open, then close. “Give my best to Anita and Marlon,” he whispered to himself, realizing he hadn’t gotten the chance to say it to Keith. Two car doors slammed shut, the motor started, and the sound faded as the car disappeared into Laurel Canyon. He heard it all, getting softer and softer, getting smaller and smaller, and pictured Keith getting on a plane, pictured Keith skipping over the ocean and landing in Europe and the blitzkrieg of hotels and stadiums and Mick and girls and mayhem that would ensue, that always seemed to encompass Keith, wherever he went. He and Keith would not go out that night. The silence of the stagnant patio and the chlorine stench were once again surrounding him, and, despite the unrelenting heat from the sun above and the cement below, he realized his abandoned hand was cold and shaking uncontrollably. He pulled his hand in, closer to his body, struggling to find warmth underneath Emmy’s hand-knit scarf. This entry was posted in Gram Fiction. 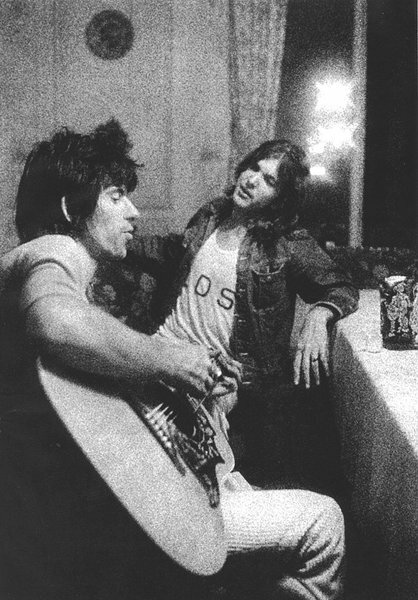 ← Poll: What do you associate most with Gram Parsons?